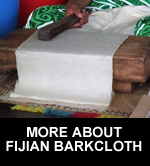 Barkcloth is hand-made, fiberous paper that is still produced as a living tradition by indigenous people in Fiji. I blend contemporary designs with this tribal craft to create works of art with a uniquely Pacific character. without specific written permission from the artist.